1911 pistols have always been a favorite among firearm enthusiasts and shooters mainly because of their classic design. What makes these pistols even more popular is the fact that you get to change their grips to suit your taste and reflect your personality. The best 1911 grips will make all the difference in aiming, firing, and hitting your target. This is exactly why you should be careful when choosing a grip for your 1911 pistol. The grip you choose should fit in your hand in such a way that it looks exactly like the gun has been designed and manufactured just for you. When selecting a 1911 grip, you need to make sure that it fits your hand perfectly without being too small or too big for your hand. This factor is important for the proper performance of your gun. If you like to have the conventional military detail on your 1911 pistol, you should consider buying wood grips with the classic diamond pattern. These grips are usually thinner, and therefore would be perfect for those of you with small- to medium-sized hands. Wood 1911 grips are also known to be the best material for engraving or etching than any other style. Some of the major advantages of wood grips are: traditional look and feel and professional quality. Tactical 1911 grips are available at relatively low prices, come in different textures, and highly durable. A 1911 pistol with tactical grips contains both textured and non-textured areas serving different purposes; while the non-textured areas provide comfort while handling the gun, textured areas can improve your grip. 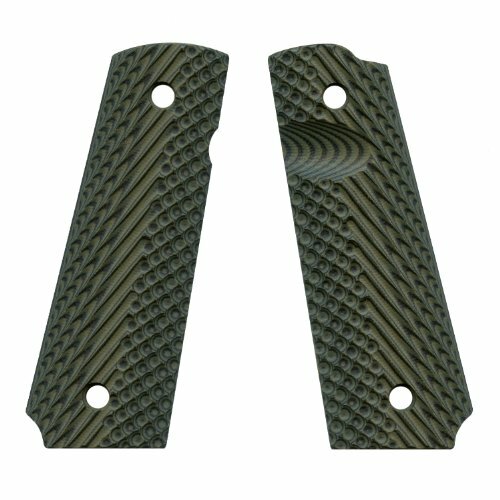 These grips will be perfect for those of you looking for an everyday carry or concealed carry function with your 1911. If you are after performance and durability, 1911 rubber grips should be your choice. The ease of use and high quality delivered by these grips are known to be their top benefits when you are looking to maintain a strong hold. The fact that rubber grips resistant to slippage makes them an excellent choice for use even during extreme weather conditions. No, rubber grips do not come with the added value features you would otherwise find in fancy grip styles; but, these grips are a solid accessory for frequent shooters. If you shoot more frequently than usual, you will certainly be happy with these grips for their durable build, affordability, and excellent grip. Simulated ivory grips are known to be the best fit for blued guns. Durability and strength are the best qualities of these grips. Yes, these grips are quite expensive, but you will be able to achieve the most coveted ivory look without having to spend more than what you can afford. 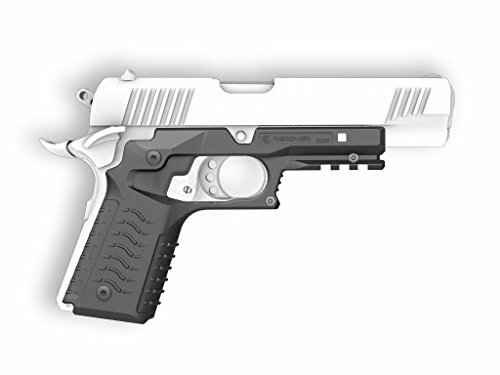 If you are someone who prefers using the same 1911 gun for several years to comes, simulated ivory grips should be your choice, for their ability to resist wear and warping. There are shooters who prefer to have a good-looking and appealing 1911 pistol rather than something traditional. 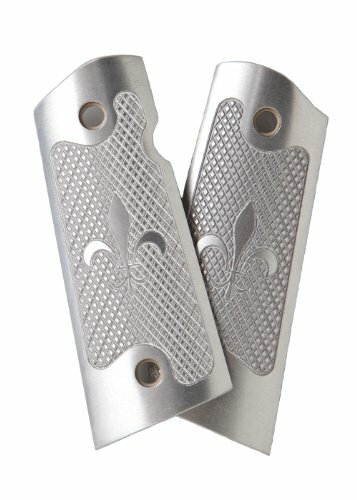 Decorative 1911 grips come in unique designs and materials, like aluminum, etched, pearls, and more, giving you the option to have your pistol reflect your individual personality. Their unique look, showpiece status, and appealing style are what make these grips interesting and highly preferred. Based in Florida, VZ Grips is currently one of the most popular companies producing grips for Colt 1911, Springfield EMP, CZ 75, Browning Hi Power, Beretta 92, Colt Double Eagle, and a lot more. In addition to grips, the company is also known for their specialty products. With the owner himself being a shooting enthusiast and an active member of the National Rifle Association (NRA), we are led to believe that the company’s 1911 grips would deliver their claims and meet our expectations, and the Operator II Standard gun grip from VZ Grips manages to do just that. When it comes to 1911 grips, VZ Grips offer around twenty five different designs for you to choose from, some of which include: Aztecs, Slants, Elite Tactical Carry Grips, Hex, Micarta, Carbon Fiber, FRAG Grips, Specialty, VZ Recons, Smooth, Operators, and of course, Operators II. The Operator II Standard Full Size 1911 grip are basically the same design as their counterparts, the Operators. The only design change is that this newer design version comes with a dynamic golf ball pattern next to the front strap, which was just a large checkering pattern in the previous version. There is also a thumb recess added to the grip for releasing the magazine, and this particular model is made of material G10. In addition to this material, you can also buy the Operator II 1911 VZ grips in materials such as carbon fiber and Micarta. This high end tactical grip is designed and manufactured in the United States and is known to be highly durable. If you are looking for an absolutely sturdy grip for your 1911, you would be completely happy with the Operator II. These grips are designed to be highly aggressive, giving you the confidence that your gun will not slide or twist while handling. Due to their excellent functionality, the Operator II grips will be perfect both for the high speed tactical environment as well as for tournaments or competitions. As mentioned earlier, the Operator II grips are made from G10, which makes it clear that they are highly durable. It is a well-known fact that rubber grips tend to rub down when you use the gun in areas with high temperatures, or even when your hands sweat a lot. This is one of the few issues that get eliminated with the use of G10, and grips made of G10 are also known to be resistant to slippage. However, if you happen to have softer hands, you could find the aggressive texture of these grips inconvenient, which will also be the case if you are used to shooting with rubber grips. Also, some users find that the screws on the grip do not always stay tight, which is another issue. The VZ Grips Operator II Standard Full Size 1911 grips are available in a lot of different colors, including black, black cherry, army green, earth brown, dirty olive, green canvas, military brown, tiger stripe, predator green, and more. Made from heavy duty G10 material. Texture could be too aggressive for some shooters. Screws tend to loosen up. Founded in the year 1999, Magpul Industries Corporation have strong industry presence and experience in producing simple, innovative and efficient products, especially in the firearm accessories category. Magpul are known for their simple, affordable and intuitive product designs, when many other companies in the market focus on delivering products that are quite confusing, complicated to use and highly expensive. The company’s 1911 Magazine Release Cut Out Grip Panels is one such product that is designed to be immensely efficient, without sacrificing its performance or quality. The 1911 Government Magazine Release Cut Out grips from Magpul Industries belong to the company’s Magpul Original Equipment (MOE) line of accessories for firearms, a line that was introduced by the company to provide affordable alternatives to the usual accessories, while maintaining the level of quality you would expect from any OEM part. These grip panels are manufactured with great quality materials, tested for durability, and are also safe for use. The Cut Out grip panels from Magpul are a new and contemporary take on the traditional 1911 grips. Made out of reinforced polymer, these grips are light in weight but still strong. The cross section is shaped in the form of a diamond to prevent twisting when you have the gun in hand, and the grip also has a great feel, not too rough, but still manages to give you a nice and firm grip. While these grips are known to be stickier than the usual checkered wood grips, they are not as aggressive as the other models you will find on the market. The two most vital features that make this grip model from Magpul to stand out are its slim design and the cut out for magazine release. The deep cutaway is something that will appeal to most shooters, especially as it makes it easy and convenient for you to pop the magazine out. The overall design of the grip is sleek, which will work great even for those of you with extra large hands. However, as the grip does not come with screws of its own, you will have to use the ones available with your gun. Also, despite its excellent gripping ability, some users do feel that it could be a bit softer to make the overall package great. Heavy-duty build with reinforced polymer. Unique diamond shaped pattern prevents twisting. Easy and convenient magazine changes. Does not include grip screws. Texture could be a bit softer. Originally introduced way back in the year 1929, the Pachmayr brand was later taken onboard by Lyman Products Corporation in 1996, and has always been respected by gunsmiths, law enforcements professionals, and shooters alike. What started as a company for producing outdoor products, the original founder’s generations of gunsmithing experience later inspired the current direction of the company. The rubber handgun grips introduced by the company in 1960s are known to have completely revolutionized the market. The foundation of Pachmayr’s grips has always been innovation, great selection of materials, and patented designs. Today, this Pachmayr tradition continues and the company’s American Legend 1911 grips are now one of the go-to models for shooting enthusiasts. The American Legend 1911 grips from Pachmayr are sleek looking grips, and the fact that they are from a leading and trusted brand in the world makes them even more appealing. The company is known for their recoil pads, gunsmith tools, PAC-SKIN, snap caps, specialty grips, grip extenders, handgun grips, and 1911 accessories, everything designed and manufactured with care and precision. Pachmayr grips are always known for their good looks, and the American Legend grips both look good and are affordable as well. With these 1911 grips, you get to enjoy the best of both worlds: the conventional look and feel of wood 1911 grips and the excellent functionality of rubber 1911 grips. While the wood part of the grip gives your gun elegant look and styling, the rubber part of it provides you with great handling capability, perfect control and delivers optimum performance. This exact combination makes these Pachmayr grips excel in functionality and style when compared to all other models in this category and price range. The ambidextrous fit of the American Legend grips makes them the right choice for any gun, no matter which hand you use or how you shoot. The wraparound grips are easy to install and available in three different finishes: Charcoal Silverstone, Rosewood, and Heritage Walnut. 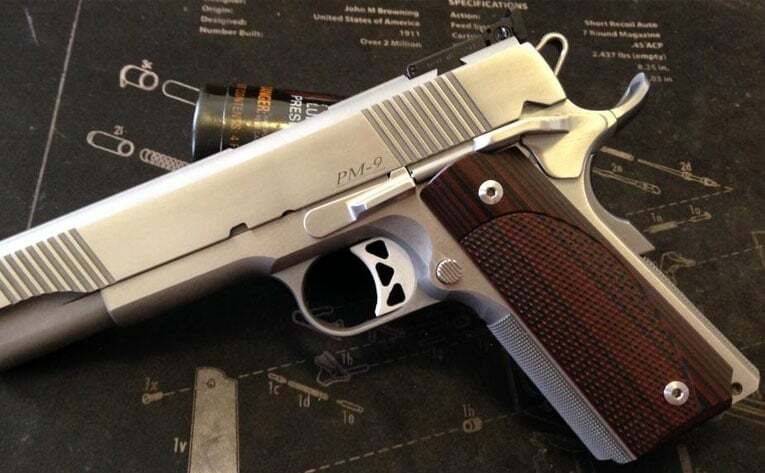 Whether you choose these grips for your stainless, blued, or any other finish of 1911 gun, they will completely enhance the looks and performance of your gun. Yes, there are some shortfalls. In some cases, even when you have a 1911 gun with ambidextrous safety, you may need to make some modifications to the grips to have them fit your gun perfectly. Also, there are chances for the rubber to wear down quickly, which sometimes can even dissolve when you use solvents to clean them. Provides great control and comfort. May need some modifications for perfect fit. The rubber part could wear down quickly. Could be too soft for some shooters. Pearce Grip is another well-known company that specializes in designing and selling replacement grips for firearms. This particular Pearce Grip model for 1911 is constructed with rubber and also comes with finger groove inserts. The package comes with a pair of black 1911 rubber grips in a conventional checkered pattern. The grips are designed to fit under any 1911 side panel grip, with just the addition of rubber finger grooves. This provides great level of flexibility, better comfort, and better handling, allowing you to configure your pistol to match your personal preferences. The side portion of these Pearce 1911 grips are designed to have only 1mm in thickness to make sure that the overall width isn’t affected too much. This feature makes these grips a great option for those of you looking for a compact solution and also, you can use any type of side panel grips your prefer (simulated ivory, wood, etc. ), with just the addition of front finger grooves. 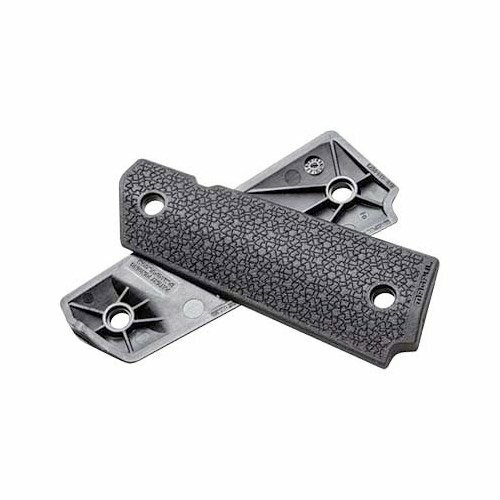 When you choose to use these Pearce grips on their own, you will be able to notice that the panels are quite thin, but still thick enough in areas where you fix them with screws, so you do not have to install screw bushings separately to support the thin grips. The overall result of this design is that it is extremely comfortable to handle and also to shoot; therefore, you wouldn’t be disappointed with this aspect. But yes, there are some shortcomings. Despite the high degree of comfort and control offered by the Pearce grips, you should remember that the grips will likely require trimming, especially if your 1911 gun is ambidextrous. Also, as with many other rubber grips, these grips may also become a bit sticky when you try to clean them with the usual cleaning products. Offers great level of control and comfort. Can be used with any type of side panels. The rubber could stick when cleaned. 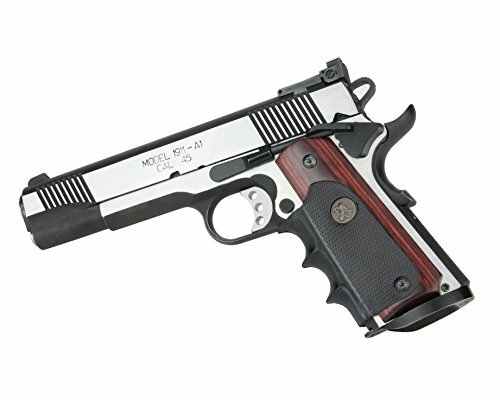 If you happen to own a 1911 gun with a removable grip, you are most likely to find a suitable grip from Hogue that will be perfect for your gun. Hogue Inc. has been in business since 1968 and the company is currently an industry leader, offering a wide range of grips, for consumers and gun manufacturers, for industry-standard guns. In addition to producing quality gun grips, the company also specializes in specialty knives, long gun stocks, accessories, and more. Hogue products are known for their world class design, attention to detail, excellent performance, function and fit. The brand’s products are also used in law enforcement, shooting competitions, and also by all forms of shooting enthusiasts. When it comes to best 1911 grips, Hogue has a lot of options you can choose from, in different variations as well. Currently, one of the most popular options in 1911 grips from Hogue is their LE Government Rubber Laser Grip that comes with finger grooves. It is a known fact that the brand’s rubberized grips are of industry standard, and this model is not an exception. If you are looking for a set of rubber grips that provide excellent comfort and performance but without having to deal with the various standard issues associated with rubber grips, this government rubber grip would be the right choice. The laser grip is designed to add a style quotient to your 1911 gun while also providing great comfort and handling capabilities. The laser enhanced (LE) grip is the company’s one of the most successful lines and is known to significantly improve your speed and accuracy, regardless of your competitive or defensive scenario. With this grip, there is a red laser integrated into the grip frame’s upper right side, which gets activated naturally when you hold on the pressure switch present on the front side of the grip. The grip also comes with elevation and windage screws so you can make adjustments whenever necessary. The LE grip has a programmable micro-processor that is present on the inside for modes such as steady, stealth target, and flashing. You can also adjust the brightness to your preference by simply pressing the pressure pad activation button and the Hogue logo. Hogue have made it easy for you to change the battery without being concerned about having to readjust the laser sight. The finger grooves, along with Hogue’s popular orthopedic hand-shape, will make your hand position easy and convenient. Their trademark cobblestone texture provides great efficiency and reduces slippage. And the best thing about the Hogue grip is that it is designed, devised and handmade in the United States. Some complaints registered by previous users of the grip are: the laser button is quite hard to push, which could be troublesome when you want your shooting to be accurate; and most importantly, some users also found that the grip doesn’t actually fit their 1911 gun model. May not fit specific models. The laser button could be hard to push. Established in 2011 by pistol and AR15 shooting enthusiasts, Strike Industries is one of the prominent brands producing firearms accessories. Despite the existence of several other firearm accessories companies, this company aims at exploring those areas that have not been touched so far, and they manage to create and deliver accessories with great versatility and quality. As their products are designed by active shooters, they tend to keep in mind the expectations of other active shooters while designing and manufacturing their products. The company’s grips, levers, bushings, and all other products scream quality and efficiency. 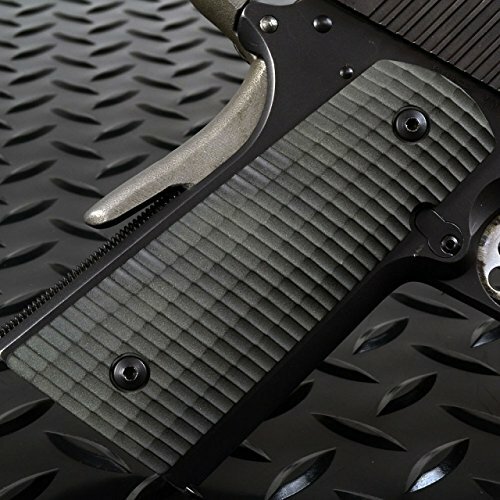 Strike Industries now has a vast line of contemporary and efficient aggressive grips for 1911 that are known to be both affordable and durable. The Polymer Extreme 1911 pistol grip is one such product from the company that holds a top place on the list of the best 1911 grips. If you are someone who doesn’t like to add bling to your guns, you would be attracted by this 1911 grip from Strike Industries mainly for its semi-gloss finish. Made from polymer with high bending strength, high impact, and heat resistant abilities, this grip is definitely for those of you who would like to spend every spare minute using your 1911 pistol, truly using and abusing your gun, and hence named right, Polymer Extreme. The dimple pattern of the Polymer Extreme grip is to provide you with great consistency and a balanced grip every single time you use your gun. With Ray Gorzyn as inspiration, a gunsmith and active shooter with more than 30 years of experience, this grip definitely makes no excuses and will excel in performance regardless of the location or climate you shoot in. The grip is very well executed and its texture is nice and provides just the right amount of grip, without being too aggressive. It would mount easily and securely on your frame, and the fact that the grip is designed with full length makes it easy for use in a magwell too. 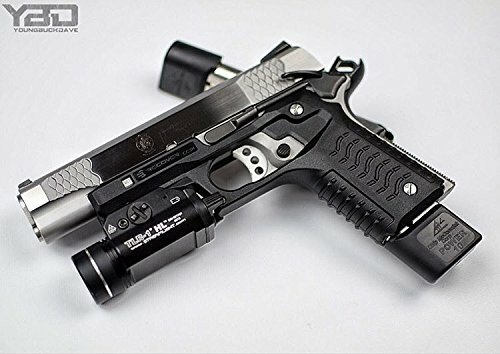 Even if you think that these semi-glossy black grips wouldn’t suit your already black 1911 pistol, you would be pleasantly shocked to see the unique and attractive look of your gun after installing the Polymer Extreme 1911 grip. The dimple pattern on the grip doesn’t make it feel like the usual metal checkering or like sandpaper for that matter, still managing to provide great grip for handling. However, some of you may feel that the grip is quite thick, especially if you have small hands. While the company has implemented a cutout on the left panel to make magazine release easy for users, it could sometimes be hard to push it, and once again, if you have small hands, you may find it interfering with your grip. The dimple pattern provides just the right amount of grip and looks good as well. Great efficiency at an affordable price tag. May not be the right choice for people with small hands. Some users may find the grip to be thicker than what they want. It could be hard to push the release button even with the cutout. With over twenty years of experience delivering more than two million sets of laser products to shooting enthusiasts and gun owners all over the world, Crimson Trace remains an irrefutable industry leader when it comes to laser sighting products. The company’s products for handguns and long guns are being used in different law enforcement agencies, US Military, sportsmen, target shooters, private security personnel, and by many others, and continue to be a hit among laser sighting product lovers. Users of Crimson Trace laser products happen to believe that they are the finest in the product category, with high quality, reliability and durability. 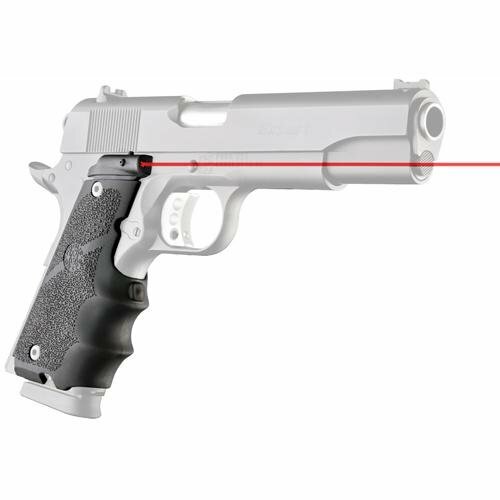 While there are brands that offer laser grips for 1911 guns, what makes this product from Crimson Trace unique is the fact that these grips come with green laser. The major advantage of green laser over the traditional red laser, as stated by the company, is that it looks brighter in ambient light conditions, say in the bright sunlight, because human eye is known to see the color green better than any other color. 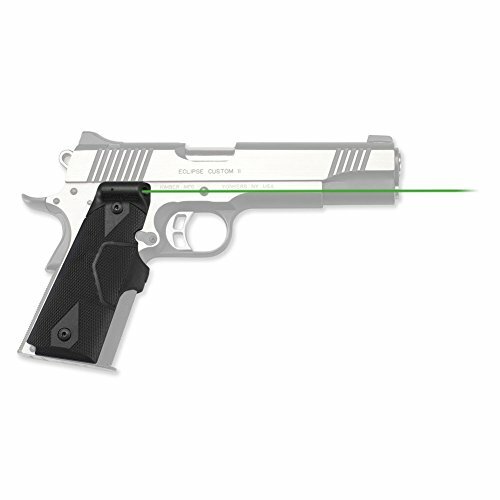 Therefore, if you have been searching for a good laser grip for your 1911 pistol and also willing to spend more for a quality purchase, the Crimson Trace green laser grips is definitely a model you should check out. One of the major appealing factors of the green laser grips from the brand is that installation is a complete snap. Once you take the original grips off, your new Crimson Trace grips will fit their place perfectly, and you can activate it without involving any type of switches, levers, or other parts replacements. The batteries remain hidden within the grips, but can be changed easily once you remove them. Despite using the smallest laser green diode, the grips are capable of emitting a powerful and easily visible green laser beam yet being able to run for more than two hours. You can activate the laser on the grips by using the pressure switch available on the front of the panels, and the switch is placed at a convenient location to make activation effortless for the user. There are also other versions of the grips in which the button is placed in the middle of the grip or on either sides of the panel to make activation easier for shooters with smaller hands. The laser sight is also known to be more positive and a lot quicker even in low light scenarios. There is also a master switch that you can use to switch the power on or off; this particular feature gives you peace of mind knowing that the laser will not get activated accidentally when you carry the gun in your bag and lose precious battery life. The grips are designed to allow you to adjust elevation and windage according to your preference. The Crimson Trace green laser grips may seem a bit fatter in the hand; while this feature could be perfect for those of you with big hands, others may find it inconvenient, as the gun will not sit in your hands perfectly. Also, as the laser is located on the upper right hand side of the grips, operation could be difficult for left hand users. If you have a weapon with ambidextrous safety, this particular model will not be right for your 1911. Green laser provides better sighting. Cannot be used in weapons with ambidextrous safety. Operation could be difficult for lefties. Could be fatter for shooters with small hands. Established in 1986, AlumaGrips are known to be the company to have introduced CNC technology to the gun grips industry. 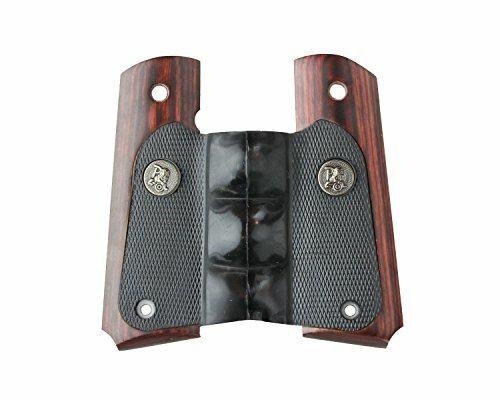 With the help of this unique and modern technology in the industry, the company has been able to design and produce truly amazing and durable line of gun grips. While there are many products that come from the brand, their 1911 gun grips happen to be one of the most loved, and they also offer options such as magwell cuts and ambidextrous safety cuts for grips of any size. AlumaGrips products have a great reputation for their most excellent fit and finish, and by looking at the Deluxe Fleur-De-Lis Magwell Grip, we can surely see why. All of AlumaGrips’ gun grips are made from high grade T6 aluminum, obviously using their advanced CNC equipment, including this particular model, which delivers the excellent fit and finish we talked about earlier. The grips are then plated into different variants, and this one here comes in the Clear Anodized variation. Also, this magwell grip belongs to the Deluxe Checkered style category, and emanates great class with this attractive embedded design. The Fleur-de-lis design on the grips adds more appeal to the product, and with everything done, the final product looks absolutely stunning, making the grips a must have for all 1911 gun users. As soon as you touch the grips, you will feel that they are cold, unlike the usual wood grips, which makes us realize the fact that these grips are made of metal. The checkering design is quite coarse, but nevertheless flawless, and so is the Fleur-de-lis, which despite being the same color as that of the rest of the panels, still looks bright and beautiful. The rest of the grips are smooth, and because they are machined, the overall finish looks consistent and feels great as well. When it comes to installing the grips to your 1911 gun, you will have no problem fitting them because of the right dimensions of the holes. And as the grips are designed to be flat, you will find no space between the frame and the grips, unlike other grip panels that require filing before fitting due to their curved design. Regardless of your shooting condition, wet or dry, these grips will deliver consistent gripping power, which is exactly what you need from a reliable grip. Once again, since the grips are made of metal, you do not have to be concerned about cracking, splitting or bending, which means that your AlumaGrips grips will last longer than expected. The only minor flaw we could pinpoint is that the grips could feel a bit wider for shooters with small hands. No fear of bending or cracking since the grips are made of metal. Shooters with small hands could find the grips wider. Recover Tactical is a brand widely known for their CC3 line of products. Designed by Tamir Porat, an industrial designed and weapons engineer from Israel, these products carry with them great legacy in terms of innovative designs. The designer’s products are not only used by civilians across the world, but also by major organizations such as the Israeli Defense Forces and others. The products from the company are known to be of highest standards when it comes to performance, and their grip and rail systems are popular for their unique design and efficiency. If you have been searching for a great grip for your 1911 gun for a long time now, you are likely to have come across the Recover Tactical Grip and Rail System. However, many of you would have just ignored the products thinking that there is a huge chance they were cheap gimmicks. But, with the CC3 H 1911 grip and rail system, we ought to mention that you would be completely surprised by this useful and strong piece of gear. The basic concept behind the Recover Tactical grip and rail system is simple: you can simply use the custom side pieces to replace the grip panels, using only the screws you are already using, without having to make any type of change on your gun. This non-detrimental adjustment allows you to easily and quickly remove the grips off your gun in case you do not want to use them anymore. Along with the screws, you can also use the trigger guard to have everything in place. More rigidity is added to the system with the help of cross-bolt screws with nuts. All of these features together make this a solid product that you can rely on for a long time to come. The grip and rail system is made from high grade, lightweight reinforced polymer, which means that it will neither cause any type of damage to your gun nor will it break. These same qualities also make it easier for you to install the system within a matter of minutes, without having to make permanent changes to your 1911 gun. The thickness of the grip is quite similar to that of standard 1911 grips. As the product comes with a lifetime warranty, you are guaranteed that it is sturdy enough to hold 0 and handle a light. Apparently, there are certain issues with the Recover Tactical 1911 Grip & Rail System. Firstly, there are issues with the overall finish of the product. While the grips looks sleek at first, take a closer look and you will be able to notice the presence of excess material around the edges. While this is a minor issue and the excess materials can be easily removed by hand, we still feel that the company could have looked into such minute details, especially when there are a lot of competitors in the market. In some cases, you might also find issues with the fitting and may need to make some changes to fix the grips to your gun. Provides great comfort and enhances control. Works only on full sized 1911s. May need adjustments for perfect fit. Established only in 2014, LOK Grips is a fairly new brand in the firearm grips and accessories industry. The company is owned and operated by Jayson Dekmar, a CNC programmer, engineer, and of course, a gun enthusiast. Today, LOK Grips is one of the very few companies that manufactures and sells gun grips at a relatively lesser price than some of the leading and custom grip brands in the market. No matter what variation of 1911 gun you have, you will be able to find a suitable grip model from LOK Grips. Some of the famous 1911 grip varieties offered by the company include Classics, Mayhem, Ridgebacks, Semis, Specialty, and Bogies. The Spec Ops Custom 1911 grip panels are designed with a golf ball pattern on the front, and the back have slanted ridges. This unique design pattern will give you excellent grip when using the gun and also makes recoil management easier. 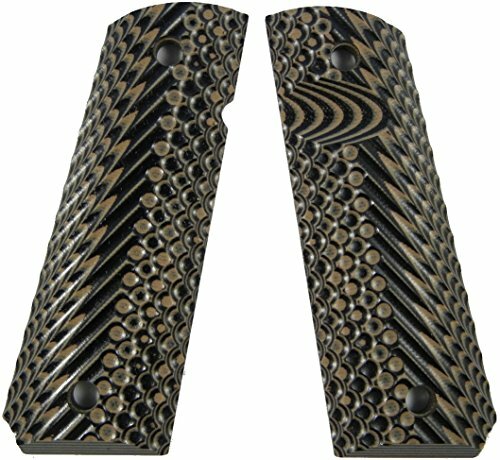 By the look of these grips, any shooter is likely to feel that they could be too aggressive; but, once you try using them, you will like the fact that they are very comfortable to use. LOK Grips allows you to choose different specifications to customize the grips to suit your needs. After you choose the texture and style of the grips, you can then move on to choosing specs such as Ambi Safety Cut, Bottom Cut, Thickness, Size, and Mag Release (Standard or Extreme). These grips are functional, attractive and also less expensive than other similar products on the market. There are very few minor flaws with these grips. Some users may feel that the texture is not as aggressive as it should be. Also, the ambidextrous safety may not be long enough for some 1911 gun models. The texture may be a little less aggressive for some shooters. Ambi safety may not be long enough.